We are debt relievers who are here to assist over -indebted consumers struggling with debt through advice, Negotiations with Credit Providers for Payments and structuring Debts. We reduce monthly obligation to affordable payment plans and negotiate with Creditors on your behalf. To meet and exceed our client’s security needs and requirements by providing them with unrivalled professional service. To collaborate, build partnerships, increase productivity and deliver the best service. 50% off (Clothing account, Furniture Account, Personal Loans, Credit Card, and Bank Overdrawn). Complete an application form and provide us with the details of all your credit provider. 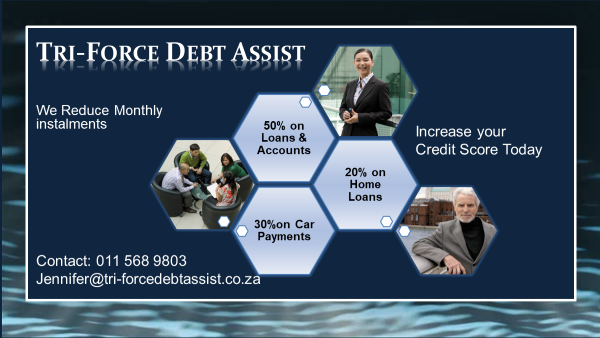 We determine whether you are over-Indebted; meaning we do your monthly expenses and monthly income. If you are over-indebted, we inform your credit providers and credit bureaus that you are under DEBT REVIEW. The credit providers will provide us with all the balance and other information in respect of your account. We will restructure your payment plan and negotiate with credit providers, then your new payment plan will be sent to all your credit providers and this payment plan will take place. The process will be completed then you must make your payment on time.